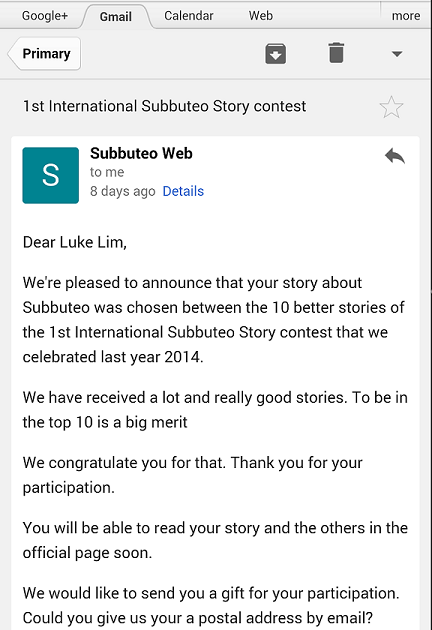 In results recently announced, Singaporean Luke Lim is among the Top 10 Finalists in the 1st International Subbuteo Story Contest held in 2014. 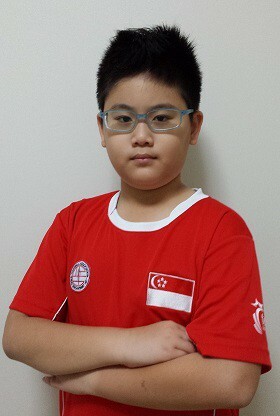 Luke, who also represented Singapore in the 2014 FISTF World Cup in Rochefort last year, has once again put Singapore on the World Map of Table Football with this achievement!! 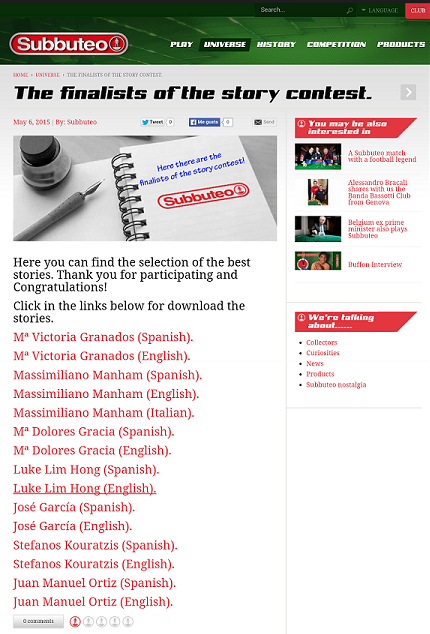 Congratulations and well done, Luke!! I was doing some spring cleaning with my family until I stumbled upon a bright green-coloured box in a drawer in my bedroom. On it wrote, ‘SUBBUTEO: TABLE SOCCER’ and soon memories of playing the game with my younger brother to winning the National Junior Championships seemed to have appeared in my head as I opened the team box and took a close look at my red-coloured figures which I had painted by hand about four years ago when I was eight. Suddenly, I stumbled upon a broken figure in my box and recalled that remorseful day, which in turn, also made me a better person. It was a usual morning during the school holidays. 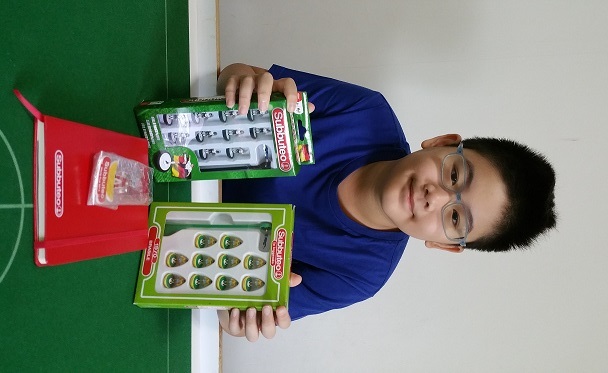 I was helping my parents clean up the breakfast table when my little brother, Tim wanted to challenge me to a game of Subbuteo as I had just won the National Junior Championships a week ago and he wanted to challenge me to prove that he is a better player than me. Tim has always been asking me to challenge him to a game ever since I had won the tournament but my reply would always be a ‘No’ as I wanted to do some holiday revision to prepare for the next school year. Since I had completed my revision for the week, I finally decided to accept his challenge. “Brother’s finally going to play with me! Brother’s finally going to play with me!”, Tim exclaimed in an overjoyed manner as he was over the moon that I, his elder brother finally wanted to play with him. Soon, we laid the pitch and started polishing and preparing our figures for this ‘derby showdown’. In a split second the pitch was laid with figures in some of the best formations as though it was a cup final. Both sides were all thinking of high-level tactics and none of them was thinking of showing mercy to the other side. In other words, both of us were going the extreme. As the clock started ticking, the game was literally a game of chess with both of us displaying some of our best skills and playing as fast as lightning. Even though Tim made much mistakes in the first few minutes, it seemed that he was improving by the minute and very soon, it was the end of the first half with the score being nil-nil. The second half then started on a high for me as I netted in two goals within the first eight minutes but then came the crucial point. I soon got the ball into a shooting position. I then pulled my finger back, ready to shoot and flicked the figure hardly. When the ball went in, I almost wanted to shout, ‘GOAL’ but Tim then exclaimed, “Offside!” My face then turned as blank as a sheet when he pointed out to me that one of my figures was behind his last defender. I was shocked. I then told him that he had a figure right behind the goal and said that he cheated as he made an extra flick after making two defending flicks. “I am not a cheater!”, Tim glared at me with a bold look. My face was seething with anger and my blood started to boil. Thick, black smoke could be seen coming out from my nostrils and if looks could kill, Tim would have already been as dead as a doornail by now. I then threatened to destroy one of his figures if he dared to claim that he wasn’t cheating. Immediately, he clenched his fist tightly, and slammed it on one of my figures until it was broken into pieces, barely leaving its upper torso. “Goodness me! How dare you destroy my figure! You deserve revenge!”, I shouted at Tim as I almost wanted to break down. I soon started to vent my anger as I slammed my hand on one of those little plastic men which belonged to Tim. ‘SMASH!’, went the figure as it broke. I then hurled a figure at him which missed him by a hair’s breadth. He then got so hot-tempered that he threw his rodded goalkeeper at me as though it was a dart. I’d figure out that the quarrel might spoil our relationship as brothers and we will hate each other as though we are rival gang members. “Boys, what on earth are you doing?! !”, exclaimed a woman at the top of her voice. We then realised that our mother had been listening to the whole quarrel that we were engaged in. “And Tom, you should have been a better elder brother and resolve the conflict in a more mature manner,” she told me as she gave me and Tim a slap on the wrist. I almost wanted to bury my head in the ground after I heard what she said. She also banned us from playing with each other for two months. We nodded sheepishly to her punishment and vowed never to resolve a conflict in such a rowdy manner again. I then reflected upon my actions and felt that I could have been a better brother and by taking revenge would only make matters worse like what Mother says, “Gandhi used to say, an eye for an eye makes the whole world blind. It is never good to take revenge just to vent your anger.” I now understand that I could have resolved the conflict in a better way.